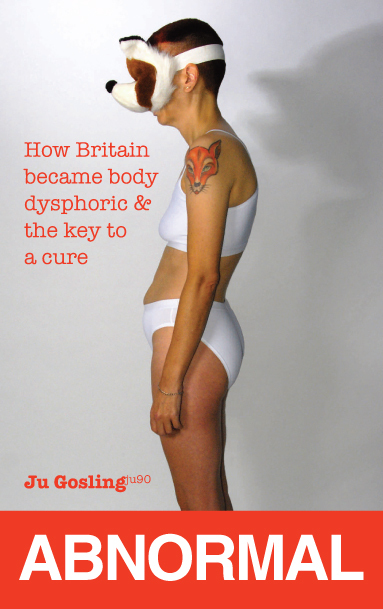 Ju Gosling's book ABNORMAL: How Britain became body dysphoric and the key to a cure is available NOW price £3.09 for the Kindle or £20 for a limited-edition hardback with full-colour images from the Abnormal exhibition. Ju Gosling aka ju90 is a 50-something disabled webmaster and multimedia storyteller who works mainly with digital lens-based media, but also with performance, text and sound. Ju works largely within the theories and traditions of the Disability Arts movement, and has gained an international reputation for her work. She is also Artistic Director of Folk in Motion CIC and Together! 2012 CIC, and a director of Bettany Press. Raised in the marshlands of Essex and originally trained as a dancer, Ju has also worked extensively in publishing and the media, having begun her career as a fanzine editor. Ju has been based in East London since the mid-1980s, although she spent 18 months living and working in Cornwall in the 1990s while she was completing her PhD in Communication and Image Studies. An internet pioneer, Ju's was the first PhD in the UK to be presented as a multimedia website (including a 60-minute film), and explored the future of the book in an electronic age alongside a critical survey of girls' reading in the 20th century. Ju remains one of the world's leading experts on girls' school stories and the St Trinian's films, and has lectured in the UK and Europe about these as well as writing for a range of publications. Ju also Co-Chairs Regard, the national LGBT disabled people's organisation, and represents LGBT disabled people on a number of national and local committees including the Social Care Institute for Excellence's Co-Production Network and its steering group: Ju was recently named by QX Magazine as an "unsung hero of the gay scene" for this work. Click here to read a full biography, and click here to read an up-to-date list of Ju's exhibitions, commissions etc. Click here to view selected press and publicity. In 2012 Ju directed the Together! 2012 free Disability Arts and Human Rights Festival as a London 2012 Local Leader on behalf of the UK Disabled People's Council. The festival took place in the Host Borough of Newham to celebrate the Paralympics (29 August-9 September 2012) and Disability History Month (22 November-22 December 2012). Ju is now Artistic Director of the Together! 2012 Community Interest Company, founded to take forward the work as part of the Paralympic Legacy. Together! 2012 CIC has already been awarded Community of Health status by Newham Clinical Commissioning Group for "outstanding services in improving the health of local people", and granted use of the 'Inspired by 2012' mark by the Cabinet Office. The 2013 and 2014 Together! Disability History Month festivals were funded by Arts Council England, as was Together! 's 2014 summer programme, and further support has come from a wide range of funders and sponsors. In February 2014 Ju directed "Access All Areas!" with Folk in Motion at Cecil Sharp House, funded by Arts Council England with the support of the English Folk Dance and Song Society (EFDSS). AAA celebrated the refurbishment of Cecil Sharp House, with the installation of a lift to create step-free acess. Ju launched the Folk in Motion project in November 2011, reinventing traditional English dances for wheelchair users with funding from Arts Council England. Folk in Motion received the London 2012 Inspire mark in January 2012, and is now a Community Interest Company led by Ju as Artistic Director. In 2013 Folk in Motion also established the East London Wheelchair Dance Club, with support from the London Borough of Newham and the Mayor of London's Freesport programme. Since 2012 Ju has been the Artist Facilitator for the Get the Message Working Group at Camden Arts Centre. The Group brings together senior educators from galleries and museums across the UK to look at best practice in the inclusion of disabled people. In September 2013 Ju was an international guest speaker and artist at the Common Pulse: Intersecting Abilities symposium and festival in Ontario, organised by Durham Art Gallery and OCAD University. In July and August 2013, Ju's installation The Memory Jar Collection was shown as part of the Disabled by Normality exhibition at the DOX Contemporary Art Gallery in Prague. The Memory Jar Collection was originally created for Ju's national touring Abnormal exhibition at the Royal College of Surgeons' Hunterian Museum in London from 15 September 2011 - 14 January 2012. In 2012 Ju was Associate Producer of Vis-a-Visibility, a joint theatre and film production by Regard, the national LGBT disabled people's organisation, and Artemis Theatre Company, about the lives of LGBT disabled people. Directed by Clare Summerskill, the production was funded by Arts Council England. A filmed version is currently in development. In September 2012 Ju performed with Signdance Collective International in Defining the Ineffable, a film installation directed by David Bower for The Meeting Room exhibition at Sevenoaks' Kaleidoscope Gallery. (Ju is currently an SDC Associate Artist.) In July 2012 Ju exhibited an artist's film at the Royal Society's Science Live exhibition, as part of the UCL's Institute of Healthy Ageing exhibit. In March 2012 Ju was keynote speaker at Engage Scotland's All Being Equal conference, about improving access to galleries for disabled people. In 2011/12 Ju's national touring Abnormal exhibition climaxed at the Royal College of Surgeons' Hunterian Museum in London from 15 September 2011 - 14 January 2012 (funded by the Wellcome Trust). Meanwhile her Canning Town Folk exhibition (funded by Arts Council England) was at Cecil Sharp House, the HQ of the English Folk Dance and Song Society (EFDSS), from 27 September until 4 December 2011. Earlier in 2011, alongside the national tour of Abnormal, Ju worked with Fittings Multimedia Arts at Croydon Clocktower with Sputnik: A Project of Possibilities. As part of the residency Ju made a short film, Fellow Traveller, which she later presented in Glasgow at Sharmanka Kinetic Theatre's (the makers of Sputnik) 15th birthday celebrations. In July 2011 Ju also released the website version of her gallery piece No Hope of Rescue, exploring human interference in emergency systems and cultural concepts of rescue. Ju's other recent work includes The Letter Writing Project, a creative response to Lee Mingwei's The Letter Writing Project at the 2009 Edinburgh Festival's Enlightenments exhibition. This work challenges the inaccessibility of the fine art world to disabled artists and art lovers, and Ju is currently developing a one-woman show. In September 2010 Ju co-produced a poetry, film and chill-out 'pop up' club, Red Jesus, at the Liberty Festival in Trafalgar Square in tribute to the late David Morris, the Mayor of London's disability adviser. In December Ju accepted David Morris's Lifetime Achievement Award on his behalf at the DaDaFest International Festival in Liverpool. From 2006-2010 Ju was the artist-adviser to/artist-in-residence at the National Disability Arts Collection and Archive at Holton Lee in Dorset with architects Sarah Wigglesworth, documenting the process in her Holton Lee Blog. In 2008 Ju completed a part-time 18-month artist's residency at the National Institute for Medical Research (NIMR), funded by the Wellcome Trust. The resulting exhibition, Abnormal: Towards a Scientific Model of Disability opened at NIMR on 31 January 2008 and ran for eight weeks before touring nationally until 2012 with further support from Wellcome. An accompanying website provides an online version of the exhibition and documents the residency as a whole. Ju has also spoken about the work at a number of conferences, including the Australian Network of Arts and Technology's Super Human: Revolution of the Species symposium in Melbourne in November 2009 where she was a keynote speaker - click here to read her presentation. In 2008 Ju was appointed as an Associate of the New Work Network, leading on diversity, and was author of the Networks's Artist's No Budget Guide to Disability Access. In September 2008 Ju's film England, exploring issues of immigration, identity and Englishness through the eyes of a child footballer from London's East End, was premiered at the A Foundation, Liverpool on 6 September 2008. It was later exhibited as an installation within the Life and Liberty exhibition at Westbourne Grove Church from September - October. In 2008 Ju also re-released Put Ya Filas On!, where teenagers from the East End put their trainers through their paces and discuss how peer pressure affects their fashion 'choices' - shot in 1991, it is just as relevant today. In 2004 Ju was awarded an Artsadmin Digital Media Fellowship for Disabled and Deaf Artists, with work including the Circle of Celebration lightbox 'stone circle'. Men in White Coats A performative installation commissioned by the ESC Labor Gallery in Graz, Austria as part of the Steirischer Herbst festival in October 2008. The installation is is now included with the Abnormal touring exhibition. Opening Doors A film-dance installation commissioned by Bradford City Council to celebrate European Year of Disabled People. Opening Doors, performed with Lee Elliott, was projected as an installation for a week in Bradford Centenary Square in January 2004. It has also been screened at the National Film Theatre as part of the 2004 London Disability Film Festival, and at The Other Film Festival in Melbourne, Australia in 2004; the Picture This film festival in Calgary, Canada in 2005; the AbilityFest film festival, India in 2007; and the Common Pulse festival in Durham, Ontario in 2013. Vulnerable Places A research project at the University of Art and Design in Zurich, featuring five dance artists — Milli Bitterli, Rika Esser, Ju Gosling, Raimund Hoghe and Simon Versnel — who use physical vulnerability within their work. The resulting film by Gitta Gsell, Augen Blicke N, was televised in Switzerland on 26/12/2005, and a book by Gesa Ziemer was published in January 2008. Perception I-IV A series of digitally manipulated photographic self-portraits printed on film and mounted on light boxes and made in response to Matisse's Nu de Dos (funded by London Arts' Innovate fund in 2003). A print version of this work was shown in 'Connections 3: Exposed' at the Joseph D. Carrier Gallery in Toronto in October/November 2007. The work was remade for DaDaFest International 2010 in Liverpool in November, and subsequently exhibited in the Nucleus exhibition at ViewTube in Stratford from August-November 2013. Helping the Handicapped A web-based artwork commissioned by the Sinnlos festival in Graz, Austria as part of the Cultural Capital of Europe 2003 programme. Ju also gave a lecture about her work in Graz on 18 June 2003. A print version of this work was shown in the 'Humans Being' exhibition at the Chicago Cultural Center in April/May 2006, and is now included with the Abnormal touring exhibition. Wheels on Fire Commissioned by the Science Museum and Apples and Snakes as part of the Naked Science programme, and performed by Ju as part of "Faltered States" at London's Science Museum on 21 March 2003 (repeated at Battersea Arts Centre on 28 March 2003). Wheels on Fire has since been performed in Zurich and Austria as well as in Bimingham and Coventry, and is still available for booking. Print versions of the accompanying projections are now included with the Abnormal touring exhibition. Transformations Ju's first solo exhibition took place at Oval House Theatre as part of the Xposure London Disability Arts Festival in November 2003. During the festival she also produced live visuals for the Drake Music Project's EQ3 performance at Croydon Clocktower. In 2001 Ju completed Fight, a film-dance installation exploring the disabled body and movement, performed with Layla Smith (funded by London Arts' Combined Arts Fund and Leicester City Gallery). Fight toured for 13 months as part of the Adorn, Equip touring exhibition originated by Leicester City Gallery, and was then presented at a weekend of artists' films during the 2002 Xposure London Disability Arts Festival. In February 2002 Ju also gave a keynote speech about the work at the Dancing Differently? conference in Manchester, organised by the Community Dance Foundation, and in November she presented the work at the Shifting Aesthetics conference in London. After the exhibition closed, in 2003 Fight was exhibited in Austria as part of the Sinnlos Festival, at the Blue Coat Gallery in Liverpool as part of DaDaFest, and at the Eco Centre in Mile End Park as part of the Identity exhibition. Fight has also been screened at The Other Film Festival in Melbourne in 2004 and the Picture This film festival in Calgary in 2005. In June 2007 Fight was exhibited at the Kennedy Center Terrace Gallery in Washington DC as part of the Renascence 07 digital art show which re-opened in New York in January 2008. Ju's Home Page site - really a collection of sites - also includes My Not-So-Secret Life as a Cyborg, a website exploring the social construction of disability through performance art, illustrated with a number of self-portraits inspired by the work of Frida Kahlo. In 1999 Ju presented this work on Sky TV's The Lounge; at the 5th International Performance Studies Conference, the 2nd International Interdisciplinary Conference on Women and Health and the Women's Studies Network (UK) Conference; and at the Kiasma Museum of Contemporary Art in Helsinki where it received national media coverage. My Not-So-Secret Life as a Cyborg was also included in the Adorn, Equip work-in-progress exhibition at Leicester City Gallery in September 1999, where Ju gave the exhibition talk. In 2000 the work was presented at the Institute of Contemporary Arts as part of the Mardi Gras Arts Festival, and at Jacksons Lane as part of their disability arts festival. This work is still being written about internationally in essays/dissertations/PhD theses. In autumn 1999 Ju completed a virtual residency at Mount Grace Priory, an English Heritage site in Yorkshire, collaborating with an onsite artist, Rita Sheppard, to create a temporary, site-specific installation. This residency was organised by The Art House, and funded by English Heritage, Yorkshire Arts and the Arts Council of England. In 2000 Ju presented this work at the Arts Council's conference Access Denied? at Sadlers Wells (part of the Get Wired conference series on new technology and the arts). In 1998 Ju completed a PhD in Communication & Image Studies at the University of Kent at Canterbury, specialising in hypermedia and presenting her thesis, Virtual Worlds of Girls - on girl power, girls' school stories and the future of reading in an electronic age - as a website/CD Rom plus a one-hour film. The website has been on virtual exhibition at London's Cyberia Cafe, reviewed in The Times and The Guardian, and featured on Sky TV's Download. It has also been hotlinked to and attracts email from all over the world. Ju has presented the work at a number of conferences and literary events. The accompanying film, The Chalet School Revisited, was premiered at the Lux Cinema in London in November 1998, and was described by Roland Keating, then Editor of BBC2's Bookmark series, as: 'A remarkable illustration of what the latest technology makes possible, and an enjoyably informative documentary in its own right.' The project is now being distributed by Cinenova and Bettany Press. For further details of Ju's career, see her CV.